Hello and Welcome to Truth Or Myth. In today’s episode, we’re taking a look at the Crossfield Class and it’s place in Starfleet History, to better understand this amazing class of Starfleet starships. 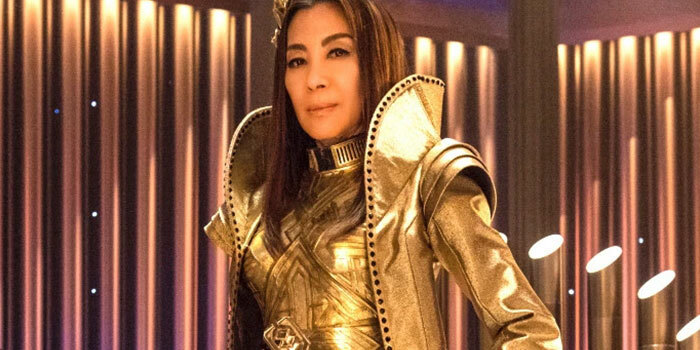 Please Note, as Star Trek: Discovery is still airing the information provided is subject to change. And if you haven’t watched Discovery yet then please note there are spoilers in this video, so you’ve been warned… With all that out of the way, let’s begin! Launched in the early 2250s, the Crossfield Class quickly made its mark in Starfleet History as a ship of the line. This starship class was launched and adapted to contain the newest most advanced Starfleet technology of the time. One of the newest, most controversial systems of this class was that of the Spore Drive. A Theoretical propulsion system, the Spore Drive, in theory, would use the mycelial network to travel anywhere in the universe almost instantly. The mycelial network connected ALL areas of the universe with each other. Though originally a failure, after 12 years of work, Lt Straal was able to perform significant Spore Drive jumps with the U.S.S. Glenn to consider the Spore Drive a success. However in 2256, after a series of successful tests, the U.S.S. Glenn’s crew was killed and the ship itself severely crippled, forcing her sister ship, the U.S.S. 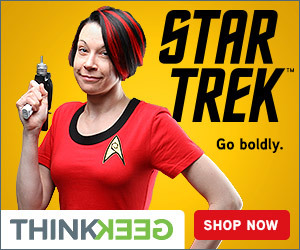 Discovery, to destroy her to prevent her from falling into Klingon Hands. With knowledge and equipment brought back from the Glenn however, Lieutenant Paul Stamets was able to recreate a full functional Spore Drive on the Discovery all be it with one significant requirement, that of a Tardigrade. 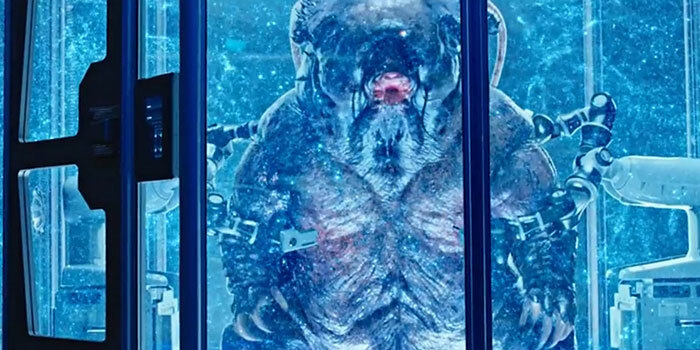 These Tardigrades were able to be connected into the Spore Drives navigational systems and jump the ship to any inputted location desired by the Captain and crew. Shortly thereafter though, it was discovered the Spore Drive was harming the Tardigrades, and in order to protect the species, Stamets genetically modified himself and was able to navigate the U.S.S. Discovery through the network as good as the Tardigrade. What wasn’t know at the time, however, was the cumulative toll the system had on Stamets with each successive jump. As such the technology would end up classified and buried never to be reused in any other Starfleet Starship Designs. The overall Length of this class is approximately 750.5 meters, though a lot of this length can be attributed to it’s longer than normal warp nacelles. It has 18 decks and a crew 136. Though sporting both a saucer section and a secondary hull, this design featured key differences in both. The saucer contained 2 inner cut out ring, a necessity to accommodate the Spore Drive. A Large outer one, with an upper hull section that would rotate, and a second smaller one that would separate the bridge section from the rest of the saucer. This sphere at the centre of the saucer was 8 decks thick with the bridge module located on deck 1. The Secondary Hull was bulky and Triangular in design. This made up not only for lost space due to the cutouts in the saucer section, but also allowed for added scientific bays for propulsion systems development, and an extra large shuttlebay which could be utilized for various missions. The Spore Drive was controlled from a special engineering lab that was adjacent to main engineering and this lab was also a short distance from a special garden designed to cultivate the spores required for this new propulsion system. The Crossfield Class was also equipped with a standard Warp Drive System. Though it’s maximum speed is unknown, it is believed to be in line with the Constitution Class Starships of the time. Meaning a maximum standard safe cruising Speed of Warp 6 and an Emergency Maximum Speed of Warp 8. Tactically this class was hybrid between the more advanced Constitution Class and the standard classes of the time. it had both Phase Canons and the newly developed Phaser Emitters. This made the Crossfield Class a powerhouse in battle. Also contained within this class were the standard photon torpedoes and launching system of the time. Having both forward and aft torpedo launchers. Shields and Deflector systems were also the most advanced of the time as was it’s tractor beam systems. The Main Bridge, located on Deck 1 was spacious and sleek in design. It utilized many transparent flat panel screens to display information to the crew. In the centre of the bridge was the captain’s chair, with helm and navigation retaining their familiar positions at the front of the bridge. Around the outer wall were many other stations that included tactical, communications, engineering and science stations. The main viewscreen was a transparent window which displayed any information or communications the commanding officer desired. Also included on the bridge were holographic emitters for use with communications. Bridge Coloring was shades of copper like the hull of the ship itself, with accents of white and blues. Also, bridge lighting was variable, being able to be darkened if the Captain wished for it, or required it. The bridge was accessed by 2 turbolifts, 1 on the front starboard side and another at the rear centre, and the bridge also had an office for the ships commanding officer to use. Other offices also known as ready rooms were located throughout the ship. 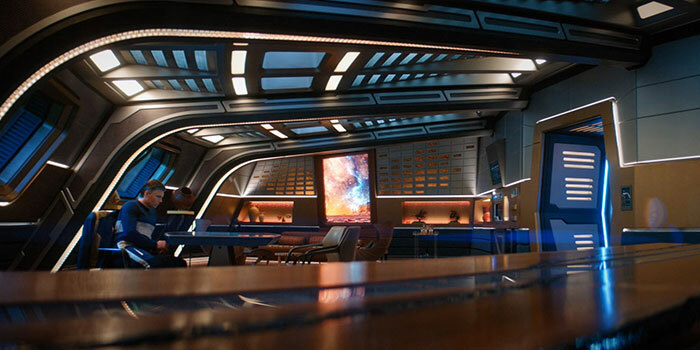 One such ready room was utilized in 2257 when Captain Christopher Pike preferred a ready room not connected to the main bridge. this was probably due to his temporary transfer from the Constitution Class U.S.S. Enterprise, a class which did not have a ready room connected to the bridge. These much larger ready rooms had more internal space, this allowed for additional seating, personalized decor and even a conference table. 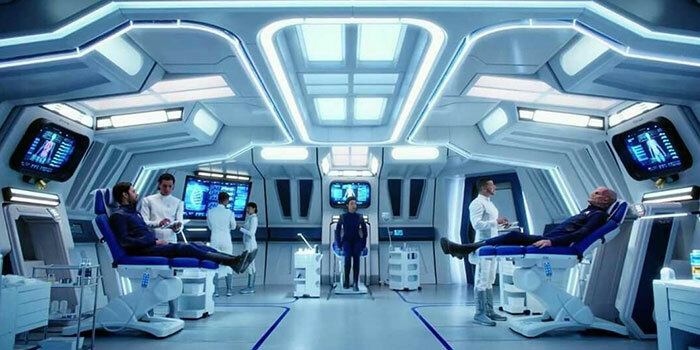 Sickbay and related medical facilities were located on deck 4, and sickbay itself contained 3 bio-beds all of which contained the most advanced technology of the time. Unlike most of the rest of the ship, sickbay colouring was almost all white with accents of dark blue throughout. The main shuttlebay was located on deck 12 and was 3 decks high. it utilized a forcefield system which allowed the door to be open while retaining the internal ship’s atmosphere. this forcefield system also allowed vehicles to enter or exit again all the while retaining the atmosphere within the bat itself. Also included in this class, were smaller vessels with the ability to repair damage to the ship and conduct various missions where speed and manoeuvrability was a requirement. The Crossfield Class also contained the most advanced transporters of the time. Unlike most ships, however, these transporters were larger and contained 2 consoles on either side of the room for control of the system and system monitoring. Senior Officers aboard the ship were given large and very customizable quarters, whereas junior officer were given smaller quarters with fewer customization options. Crewmen were often doubled up in smaller quarters and these quarters were not customizable at all. All quarters however contained holographic emitters for communication and display purposes. The Crossfield Class was able to have over 300 scientific studies and experiments being conducted at 1 time. This was a record for any class starship and as such this class had the most extensive array of scientific equipment and laboratories ever assembled by Starfleet. 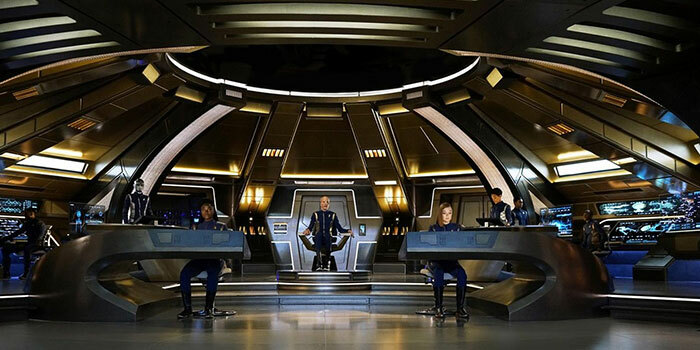 On the USS Discovery, during Pikes Command, the bridge ready room was converted to a science lab of its own with dedicated computer consoles and access utilized by science officers to analyze mission data. The Main Mess Hall was located on Deck 5 and contained viewports for the crew to enjoy while consuming their meals. Smaller mess halls were also located on Deck 2. The Crossfield Class also contained the most advanced food synthesizers of the time, the precursors to the Replicator system utilized in the 24th Century. For tactical training, this class also contained a holo-environment simulator. This simulator was able to train officers in combat techniques programmed with a variety of scenarios and locations. 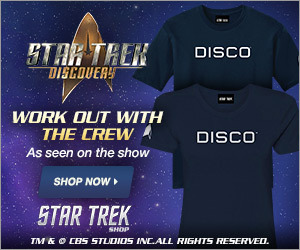 The USS Discovery was instrumental in many Historical Missions. First of note was its role in the War with the Klingon Empire. Using it’s Spore Drive, it was able to penetrate the Klingons stealth cloaking technology which essentially rendered the Klingon cloak useless. Second, the USS Discovery would be the first Federation Starship to travel to what would become known as the Mirror Universe. A Universe virtually identical to our own Prime Universe with one major Exception, Earth was an Empire that spread across the Alpha Quadrant enslaving and conquering races. Knowledge of this Universe would quickly be classified and buried in 2256 after the Discovery returned to the Prime Universe. And third, it was instrumental in discovering the cause and intent of 7 signals that had appeared throughout the Galaxy in 2257. An amazing class of starship, this class would serve Starfleet and the United Federation with distinction. And would prove to all the worlds of the Federation that Starfleet was and would always remain at the forefront of scientific technology and exploration. Thank you for watching today’s episode of Truth OR Myth. What do you think of the Crossfield Class? Leave your comments in the section below and don’t forget to like the video and subscribe to the channel hitting that little bell icon so you don’t miss a single video we release. Want to help the channel out with it’s Spore Drive Research? Well then become a Patron of ours.